Located just west of the Rollins Savanna Forest Preserve, Carillon North is an active adult community in historic Grayslake, Illinois. Developed by Cambridge Homes, this gated community offers 361 residences. Buyers can choose from an assortment of resale inventory among single-family houses as well as ranch townhomes at Carillon North. Residents enjoy country living, yet have easy access to health care, shopping, and entertainment. 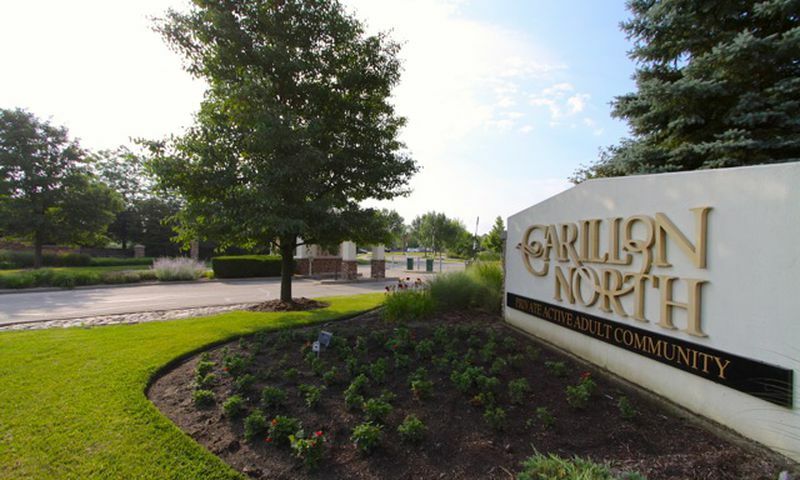 Carillon North in Grayslake is secured with a manned front gate guard house. In addition, there are two other security gates that are only accessible with personal residency cards. The amenities at the 10,000 square-foot clubhouse at Carillon North make it easy and fun to stay fit and active. Indoors, residents have use of a fitness center with aerobics studio, computers, a lending library, and a billiard room. The clubhouse also provides hobby rooms for all the art and crafts lovers and a ballroom for social gatherings. The grounds include several tennis courts, horseshoe pits, and walking and biking paths. Attached to the clubhouse is a heated indoor pool that is enclosed in glass to allow for utmost use, rain or shine. The pool also includes a hot tub. There are over 30 clubs and classes at Carillon North that are developed and implemented by the home owners. In addition to the clubhouse amenities, residents also have access to the adjacent Grayslake Golf Course. While it is a shorter 9-hole course, it has plenty of water and natural terrain to make it challenging enough for novices and advanced players alike. Carillon North in Grayslake is comprised of a total of 361 attached and single-family homes, constructed between 1999 and 2004 by Cambridge Homes. The attached residences offer between 1,268 and 1,694 square feet of living space and are divided between three, four, and six-unit buildings. Single-family homes are slightly larger with 1,700 to 2,300 square feet. Homes come with two-car garages, usually two bathrooms, and two bedrooms with some homes offering an additional den or third bedroom. Other features include breakfast areas/nooks, over-sized living room/dining room combinations, family rooms, walk-in closets, and garden tubs. Outside lawn and snow maintenance is included for all home owners. Additionally, residents of the attached homes enjoy additional maintenance of the exterior of their homes. This 55+ community offers a perfect blend of small community feel with a wide variety of amenities. Carillon North has plenty of ways for social interaction between the home owners. One of the perfect ways to make new friends is by participating in any of the dozens of clubs or classes that are coordinated by the residents' activities committee. Classes include art lessons (water color, oil, acrylic), jewelry making, and balance class. Social groups and activities clubs cater to diverse interests from aerobics to yoga. Carillon North is located in the heart of Lake County, four miles west of I-94 between Highways 45 and 83. Residents have easy access to health care, shopping, continued education facilities, and transportation. Quality medical services are available at nearby Lake Forest, Condell, and Vista Medical centers. Residents can shop at the local boutiques in downtown Grayslake, or go to the outlets at Gurnee Mills and Kenosha. The Grayslake Library offers a variety of classes and programs. Residents can also continue their education at the College of Lake County, or enjoy its concerts and theater events. Metro train service makes it easy to travel without using a car, especially to Chicago which is just an easy train ride away. There are plenty of activities available in Carillon North. Here is a sample of some of the clubs, activities and classes offered here. The Getaway series homes are arranged in 6-plex configurations arranged in a "U" shape. Each building contains two of each model. The Scottsdale models are on the end, the Lagunas are in the middle and the Carmels are in the back. Most units are built on a slab but there are some buildings that offer basements. All exterior building maintenance, lawn care, snow removal and landscaping is maintained by the association. The Masters Series Townhomes were built in three and four-unit configurations. Each model is available as either a middle or end unit. All plans include two bedrooms and a 2-car garage. Basements are optional. The association fees include all exterior building maintenance plus lawn care, snow removal and landscaping. The Resort Series single-family homes are offered in five floor plans. These thoughtful designs offer open layouts that include spacious family rooms, expansive kitchens, dining rooms and living rooms. Additional options at the time of construction such as sunrooms, extended family rooms and basements provide for even more space. The association maintains all lawncare, snow removal and landscaping but homeowners are responsible for maintaining the exterior of their homes. We haven't really settled in as yet, but so far so good. A neighbor stopped in and gave us a run down on the activities and brought warm home-made cookies. Management has been very helpful and we hope to soon get more involved. This is a friendly, active community. I've made some good friends. I feeling like I live in the country yet everything I need is just a short drive away. We love the neighborhood and especially like that each entrance has a gate for privacy. The people here are friendly, the clubhouse is wonderful and we even have a nice little 9-hole golf course. We get a lot of use out of everything in the community and really like having everything so close. Friendly homeowners and beautiful surroundings makes this a great place to come to work everyday. I have been here for ten years and never regretted once my decision to move here. We are a very active community, and it is like having an extended family. 55places.com is not affiliated with the developer(s) or homeowners association of Carillon North. The information you submit is distributed to a 55places.com Partner Agent, who is a licensed real estate agent. The information regarding Carillon North has not been verified or approved by the developer or homeowners association. Please verify all information prior to purchasing. 55places.com is not responsible for any errors regarding the information displayed on this website.